The heart of Nepal is where you’ll find Pokhara, commonly known as the gateway to the Annapurna Circuit. This is the city where many trekkers stay before or after their trek. As the second largest city in Nepal after Kathmandu, it is a pretty crowded city but it’s not quite so chaotic. Pokhara was one of my favorite places in Nepal, as I loved the contrast of city life with nature. These top things to do in Pokhara, Nepal will give you a glimpse into what it’s like visiting Pokhara. This beautiful lake is tucked in between the mountains and the main part of the city. Take a walk around the lake, hire a boat, or find a good viewpoint and simply enjoy the view. This was one of my favorite places for the perfect sunset view. 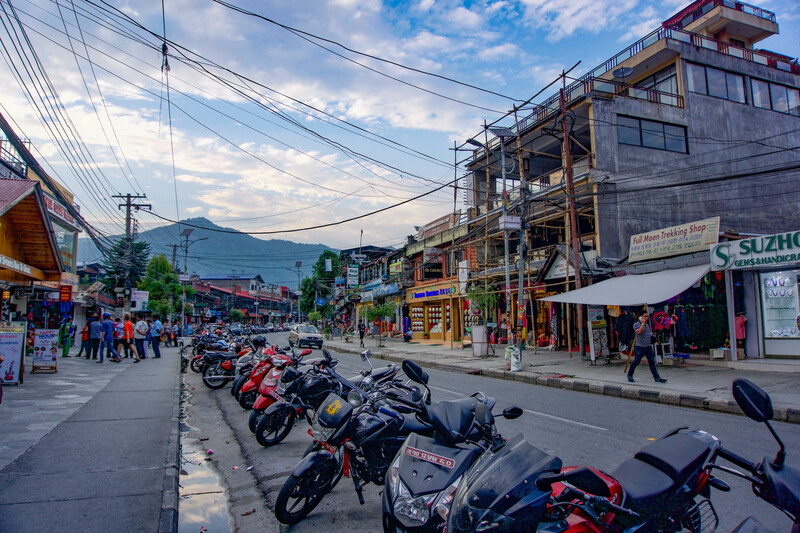 The streets of Pokhara are lined with all kinds of restaurants. You can get just about any type of food, including pizza. I recommend sticking to the traditional and seeking out momos, delicious dumplings most commonly stuffed with meat or vegetables. I had amazing momos at Doko Restaurant and Bar, and had an overall pleasant experience seated outside on their upstairs patio in the perfect people-watching viewpoint. The streets are also lined with countless shops offering great deals (though it’s not quite as cheap as Kathmandu). If you’re staying in Pokhara before trekking, you can pick up just about any kind of mountaineering gear that you need from here. Even if you’re not trekking, they have great bargains on what is claimed to be North Face and other name brand gear. You’ll also find plenty of other items similar to the shops in Kathmandu, like Nepalese handicrafts, jewelry, scarves, sculptures, clothing, Nepalese tea, handmade rice paper journals, prayer flags, and much more. Learn all about Nepal’s mountains and the mountaineers who climbed them at the International Mountain Museum. Throughout its exhibits, the museum also weaves in the culture and lifestyle of the local mountain people, and even the legend of the Yeti. Yet, the museum is not only about historical events. Many mountains and their communities including Mount Everest are in danger from both climate change and the many climbers who scale its slopes. To help protect the mountains and their people, the museum is spreading awareness about the dangers of climate change and how the locals are currently coping with the changes. Up on the top of Ananda Hill sits the World Peace Pagoda, a Buddhist monument dedicated to world peace. The most common way to get here is to hire a boat to the shore just beneath the pagoda and hike the steep trail up to the top from there. From here you’ll find views overlooking the Annapura mountain range, Phewa Lake, and the city of Pokhara. To take the height up to the next level, try one of the many popular adventure activities that will reward you with stunning views of the Himalayas like paragliding, bungee jumping, and zip lining. In case that’s still not high enough, I have heard stellar recommendations for taking an early morning mountain flight in a small propeller plane to get even closer to those impressive peaks. This famous waterfall just two kilometers southwest of downtown Pokhara is known locally as Patale Chhango, or Devi’s Fall. The story goes that Mrs. Davis, a Swiss citizen, was taking a bath with her husband just ahead of the falls back in 1961 when she was swept away by the water and died. Since then, it has been known as Davis Fall. When visiting, look out for signs that say Devi’s Fall — this is the same waterfall, but is sometimes called Devi’s instead of Davis due to a typographical error. The water levels were still low during my visit, but during summer and rainy season the waterfall powerfully gushes through the rocks. The best time to visit is said to be June through September. Despite how much I loved being out exploring Pokhara, every day I looked forward to returning to my room at Temple Tree Resort. This peaceful oasis in downtown Pokhara has an outdoor infinity pool to cool off on those especially hot days, an on-site restaurant serving breakfast, lunch, and dinner, and a bar right between the pool and restaurant. Rooms feature private balconies with garden views, air conditioning, and luxurious ensuite bathrooms. The WiFi wasn’t the greatest in the rooms, but it worked okay on the balcony and was even faster from the main lobby. Check the latest rates here for your stay. You can get to Pokhara either by bus or air. The bus ride will take about six hours from Kathmandu, but will be very bumpy as the roads are not in good shape and the ride will likely be quite wild as there are not really rules of the road in Nepal. Therefore, I’d recommend taking one of the tourist buses instead of the public ones as they are typically in better condition to drive the rough, curvy roads. Note that if you are returning to Kathmandu from Pokhara, the ride back can take significantly longer as there is always heavy traffic entering back into the city. Alternatively, the flight is only about 25 minutes between Pokhara and Kathmandu. Buddha Air, Yeti Air, and a few other small airlines operate on this route. Keep in mind that if the weather is bad (even if it’s just raining) the flights can be heavily delayed or even cancelled all together. However, if you stick around until the weather is good you will benefit from incredible views of the Himalayas from above. Pokhara definitely has a tourist vibe going on. But I still loved everything about the busy streets right alongside the mountain-lined lake. These things to do in Pokhara, Nepal should keep you plenty busy for your visit, whether you’re passing through on your way to a trek or sticking around to explore the city. Special thanks to the Himalayan Travel Mart, Pacific Asia Travel Association (PATA), and Nepal Tourism Board for facilitating this trip. All opinions are my own. Thank you for reminding me of Pokhara after so many years. I traveled there around 4 or 5 years ago and, to be very honest, I didn’t like it during my first visit, as I felt it was too westernized. However, after doing some pretty tough treks around Annapurna, I felt that Pokhara was like a paradise and I couldn’t enjoy more, wandering around the lake and drinking beers at the endless bars. Cheers! Yes I can definitely see that! Thanks for sharing your experience! Marissa, thanks for sharing this informative and recent review of Pokhara! I’m looking forward to my trip there! You’re welcome, hope you enjoy your trip Phillip! This was the perfect guide for traveling in Pokhara.. Enjoyed watching this pictures.